This year has been one in which I have found myself in love with Young Adult love stories, that is, the YA Contemporary genre. 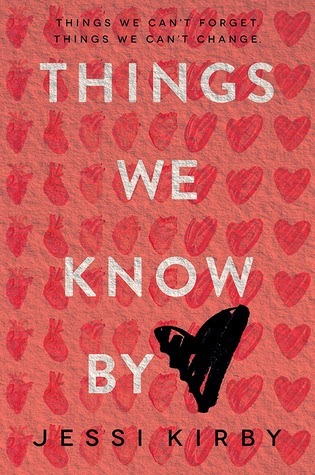 Because of that, I found myself extremely excited when I found myself with an ARC of Things We Know By Heart, as not only was the storyline unique, but the book lived up to the expectations I had of it. There were many different unique parts to this book, and reading it was like watching a movie. Well, better than watching a movie. The premise of this novel is that the main character, Quinn, loses her boyfriend in an accident, and after his death, goes searching for the young man whose life was saved by the donation of that boyfriend's heart. I found this a very interesting concept, because personally, I put a lot of stock in a person's heart. I know it's just an organ, but that romantic part of me insists that it defines who you are. So that brings up the question, does Quinn fall for that young man - his name is Colton, by the way - because he has her boyfriend's heart, or because she genuinely loves him for himself? There's not really an answer to this question; relationships are all about trust, after all, and yet even so, the story was beautifully done, and every moment was either so beautiful it was unreal, or so heartbreakingly painful that it still hurts just to think about it. The storyline of this novel was gorgeously done, and yet more than that, I think I fell in love with the characters. They each have difficulties they face on their own, and watching Quinn and Colton struggle to live life the way they're meant to is, again, both amazing and indescribably sad. Nevertheless, when I think back on the book, the plot seems to be a bit plain. It's the characters that add the exquisiteness to the story. Quinn was surprisingly easy to empathize with, and Colton was something else entirely. He was sweet and romantic and incredibly courageous, and all the while he was desperately trying to hide from Quinn what she already knew. Through their relationship, they come into themselves, and their character growth was really well written. It is by no means an easy association between Quinn and Colton, but every second was worth it. The best and most uncommon aspect of this book is most definitely the quotes found at the top of each chapter. They're excerpts of professional references about hearts, and contain anything from anatomical information to statistics. They make the story that much more real, and sometimes I feel like I swooned harder over those stats than I did the actual book. It was a lovely addition to an already alluring book, and I could not be any more excited about them. My favorite one? "Every heart sings a song, incomplete, until another heart whispers back." For anyone who regularly reads contemporary novels or is ever in the mood for one, Things We Know By Heart is a great one to pick up. While it's a quick read, it hits all the right buttons to get you tearing up, and it's a story you won't soon forget. The characters have an incredible amount of depth to them, and they make this story perfect. There's no exaggeration or drama - just reality. This isn't some silly teen romance to read when you're bored (not that there's anything wrong with that). It's just that this book really makes you think, love, and feel. Book Synopsis: When Quinn Sullivan meets the recipient of her boyfriend’s donated heart, the two form an unexpected connection.